Hey Tampa - what are your plans this weekend? 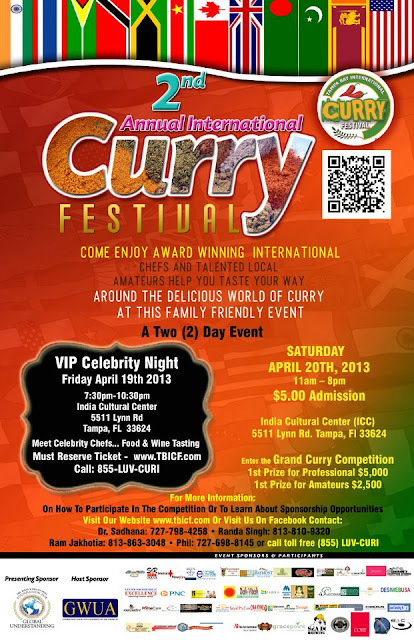 April 19th - 20th is the 2nd Annual International Curry Festival. I often joke that we are a city who likes to throw festivals, we have them for everything. This one I am quite excited for and my friend Leslie (leslie-floyd.com) asked me to be her partner in crime at the International Curry Festival. Friday, April 19th is a VIP Charity Ball To Fight Local and Global Hunger and tickets are still available. I am looking forward to attending a black tie event, it has been way too long since I have worn a gown. From the TBICF website: Join the Fun and Celebrate the Dynamic Art of Curry Cooking! Live Music & Local Entertainment Curry Cuisine from the World Over Dozens and Dozens of Vendor Booths Children's Activities - Bounce Houses Family Fun - Evening Concert Join thousands for a day of family fun and entertainment as Tampa Bay celebrates the culinary wonders of cooking with curry. Stroll over 50 plus vendor booths while local area performers dazzle and entertain you and your family. Let award-winning international chefs and talented local amateurs help you taste your way around the delicious world of Curry at the family-friendly International Curry Festival. Feel the excitement as Chefs from all over compete for over $20,000 in prizes and the title of Curry Grand Champion.